Whether you bought into the notion that there was not going to be an NFL season or not, there is no denying that a year without football would be an awful endeavor. But luckily the sides came to terms, the football season is on, and we are ready to check out the latest game of Madden. After another great outing last year (9/10 according to our review) can the series continue its upward trend? Read our full review to find out. Each year the guys and gals over at Tiburon try to find new ways to entice its fan base both new and old into checking out their newest iteration. This is done a number of different ways with roster updates, new modes, and enhanced gameplay. In Madden NFL 12 you don’t necessarily have that “killer feature” that instantly will draw in fans so instead the developers have a slew of new enhancements to the experience that they hope will draw fans back into the game. One of the most noticeable changes in this year’s game is the heavy emphasis on mirroring what you watch each Sunday to the on screen gameplay. From the entrance of your team onto the field, to the opening coin toss, to the kick off there is a lot more emphasis on increasing the realism of the experience. One of the changes I wasn’t a huge fan of was the new kicking system which has the camera pulled back to give it a broadcast sort of feel. This is fine for kick offs but on field goals it makes it even more difficult to line up your kick. You can see right away that the developers were aware that players might not enjoy it so with the tap of the trigger you can go back to the classic view. In terms of the on field gameplay there have actually been quite a few small improvements that make a big deal in the way you play the game. First the new tackling system is a huge step in the right direction for the series. Some tackles may stop you in your tracks while others will slow you down. It just feels a lot more realistic that each tackle is determined by more than just a players tackling rating. Defenses in general seem to be better equipped in Madden NFL 12 playing better zone coverage and making it increasingly more difficult to put up big numbers on the higher difficulty settings. I would be doing a disservice to you all if I didn’t mention the 3D grass that looks incredible. Maybe I drank some of the Kool-Aid but each time the camera did a zoom on the grass I sat back and was like wow. I suppose in my defense I have been playing the series since the beginning when it looked like you were playing on a green tarp and to see a very natural three dimensional grass took me off guard. The key addition in terms of modes has to be the increased focus and improvements on the Franchise mode. This of course is the mode many fans come back to year on year. The big change this year is the Dynamic Player Performance which is a fancy way of saying that just because your quarterback has a 90 rating doesn’t mean he will play that way each week. Just like the real deal a lot of how you start a game will be based on how you ended the previous week. However there were so many times that I had a great prior week but had a poor start to a game and have to find a way to work your way back into the game. My favorite new franchise feature is the free agent bidding feature. It too is a simple concept where you have to compete against all of the other teams in the league to try and scoop up players to fit your needs in a frantic bidding war. I found myself outbidding everyone but then running out of cap room which brings up the balance that you have to figure out quickly when trying to sign a player. The franchise mode is filled with small other little improvements that go a long way in making the entire experience feel fresh. I was saddened to see that the Superstar Mode outside of a few minor tweaks has gone unchanged this year. 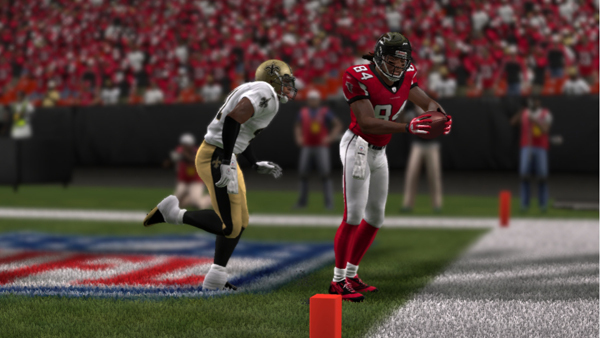 The Madden Franchise in the past few years has been a game of inches in the visual department and thus is still the case in Madden NFL 12. There are small improvements like more varied animations and better detail on getting pre-game routines accurate for each of the teams. However overall there just isn’t a lot improved on the visual front that’s worth noting. I don’t know if my skills have diminished over the years or if Madden is becoming more challenging but I found myself really struggling on the All-Pro difficulty setting where I usually in years past have easily beat the computer. However unlike in years past I felt like the computer was beating me because I was making mistakes or not capitalizing on opportunities. My fondest memories of playing Madden NFL 12 over the last few weeks have been in the franchise mode which really does feel new and refreshed. 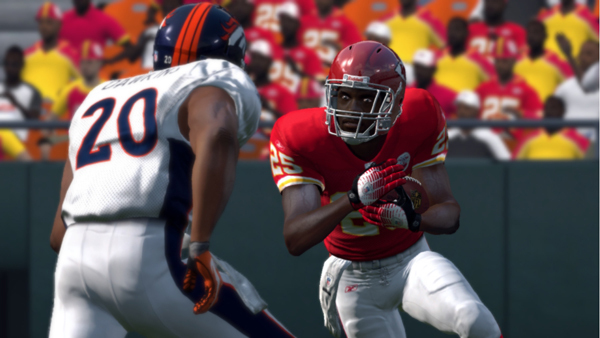 Madden NFL 12 is yet another great entry into the Madden franchise. The improvements although iterative and not innovative still go a far way in making this a fun game of football. I do believe the franchise is nearing the stage where it will need to get out of the pocket a little and fire one down the field in order to keep the franchise at this stature. You can only be iterative for so long before you have to be innovative again and you do get the feeling in Madden NFL 12 that the series is nearing that point. 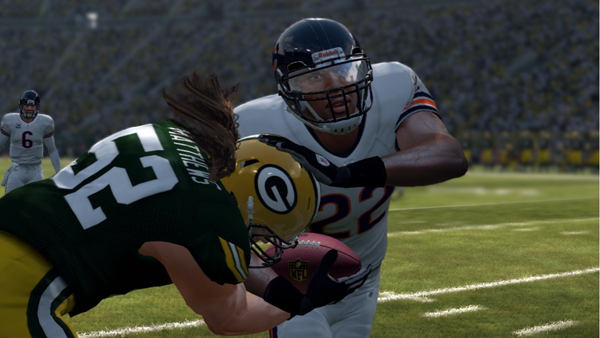 Madden NFL 13 is a great game of football. It is also a shining example of a series that could really use a new console to help freshen up the franchise which is starting to feel in need of a pick me up.